1/ A fully equipped work area and the right tools are very important for printmaking. A glass surface is good for mixing and rolling out inks with small and large rollers. I use oil based lithographic inks. I begin with a clear 1\8 inch thick plexiglas sheet, called a plate, a small 2 inch to 6 inch polyurethane roller, a 1 1\2 inch wide palette knife and Q-Tips for drawing and moving the ink around on the plate. I begin with black ink so that I can see what I am doing throughout the entire image making process. My monotype and monoprinting process involves ink viscosity. Viscosity printing is all in the consistency of the ink. I use stiff dry ink (high viscosity) and oily loose ink (low viscosity) to blend and resist each other depending on the sequence of how I roll the inks on top of one another. 2/ I lay a fairly stiff black lithographic ink down with a palette knife on the clear plexiglas plate. The plate is on the light table for visibility. I move the ink around on the plate with a palette knife and Q-Tips. I continue moving the ink around the plate until an image begins to form or something catches my attention. I draw the image out by adding more ink with a small roller and wiping away with Q-Tips. 3/ With a small 2 inch soft roller and a palette knife I add more ink and begin to shape the figures of the woman, the bear, the crow, the rose, the tree, and the trowel. I fine tune the face and add more contrast by making some areas darker. This process is a continuation of adding ink and wiping it away, mostly with Q-Tips. 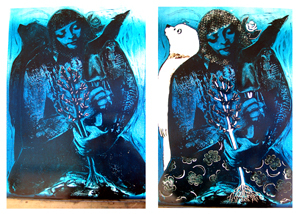 4/ There is plenty of ink on the plate to pull a black and white print before I add the blue ink. I want to pull a print of this image at this stage because of the fresh quality of the drawing and because I like the piece as a black and white composition. 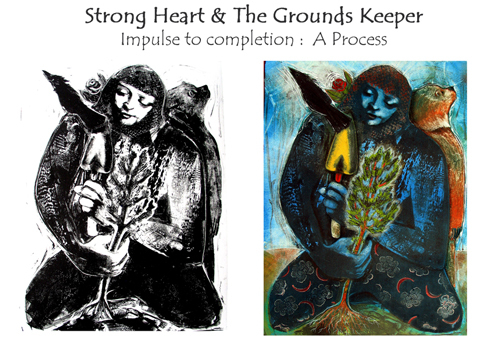 This printed monotype is called “Strong Heart.” As a print maker I am used to the images printing backwards. 5/ Using a large medium durometer 18 inch rubber roller with a 4-3\4 inch diameter, I roll an oily blue ink over the entire plate. I use raw linseed oil to loosen the ink to the right oily consistency. I begin to wipe the oily ink off selected areas with Q-Tips. I have carved the moon and flower from an eraser creating a rubber stamp and I now press the stamps into the figure’s pants to create a design. The open areas will be clear for the next color that will be red orange. All of the design elements as well as color choices are made as I am developing the image on the spot. 6/ With a large soft durometer 18 inch rubber roller with a 6- 3\4 inch diameter I roll a stiff and dry red orange ink over the entire plate. When I roll a dry ink over an oily ink (blue) the oily layer resists the dry ink and the red orange color only goes in where I have opened the plate. I begin to wipe away selected areas to receive the next color. With a small roller I add an oily yellow ink to small areas. Oily ink on top of all inks will blend. The only area it stays pure is where the plate is completely open at the trowel. Magnesium carbonate powder is used to stiffen the ink to the right consistency and viscosity. 7/ I continue to lighten the image by taking away ink and adding more black to give the composition more depth. I use a Q-Tip to blend the ink on the bear to make it seem more fur-like. I carefully add more green, yellow, and red. The printed monoprint image is called “The Grounds Keeper.” The final print never looks exactly like the plate does on the light table. 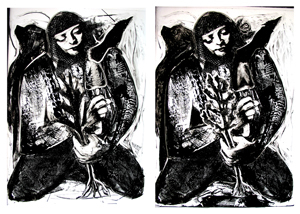 I can’t completely control the monotype or monoprint. The finished print is always a bit of a mystery. It is the magic and mystery of monoprinting that has kept me printing for 20 years. I love this process. Monotype – A monotype is a single print pulled from a plate on which ink has been applied and is a one of a kind print that contains no repeatable matrix in the image that can be reproduced, such as a carved stamp or part of another fixed matrix. 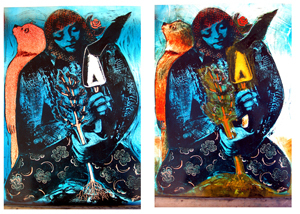 Monoprint – A monoprint is a single print pulled from a plate on which ink has been applied and is a one of a kind print that does contain a matrix in the image that can be repeated, such as carved stamp or part of another fixed matrix. Durometer – The durometer is a unit of measure describing the softness to hardness of rubber rollers.